According to the Motor Vehicles and Road Traffic Act, Chap 48:50, section 43 D(1)(b), a person failing to place a child who is five years and under in a child restraint or booster seat in the vehicle while driving the vehicle, can be faced with a fixed penalty of $1000.00. 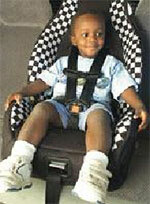 The safest car seat is one that best fits your child and your car and is easiest for you to use. However, if a car seat is not properly installed or used incorrectly, it can still present safety problems. Though most parents move their child from a rear-facing to a forward-facing position when he reaches 12 months and 20 pounds, this is the minimum age and weight requirement for facing forward. Experts say that the longer you keep your child in a rear-facing position, the safer he'll be (that's because, in a frontal collision, the stress on a forward-facing child's neck can injure his spine). Baby (or infant-only) car seats: These face the rear of the car and have a 20-lb. weight limit. Convertible (or infant-toddler) car seats: These function as both rear-facing infant seats and forward-facing seats. Most new ones are designed to hold a baby of up to 30 or 35 lbs. facing the rear of the car. Belt-positioning booster seats: These seats are for kids who are at least 3 and weigh at least 40 pounds. They use the regular in-car shoulder belts to secure the child. Kids aren't ready to make the switch from a booster seat to seat belts until they're at least 4 feet 9 inches tall, typically between ages 8 and 10. 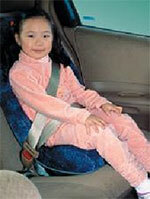 A booster seat protects a child better than seat belts alone, and, in the event of a collision, an ill-fitting adult seat belt can actually cause injury instead of preventing it. If the lap belt rests on your child's tummy (which it's likely to do without a booster), for instance, he could suffer stomach, liver, or spleen damage. And if the shoulder belt rests against his neck rather than his chest, he may try to move it under his arm (where it could crack his ribs and damage internal organs) or behind his back (where it offers no protection at all against head, neck, or spinal injuries). Does he sit all the way back against the car's seat? Do his knees bend comfortably at the edge of the seat? Does the lap belt naturally rest below his belly, touching the top of his thighs? Is the shoulder belt centered across his shoulder and chest? Can he stay seated like this for the whole trip? If you answer no to any of these questions, your child still needs to use a booster seat (some are designed for kids weighing up to 100 pounds).